Between April 2012 and July 2014 I worked for the Communications, Energy and Paperworkers Union (CEP), which merged with the Canadian Auto Workers during this period to create Unifor. In my position as CEP researcher I was assigned to meetings about Employment Insurance and the Canadian Pension Plan as well as Friends of Medicare and the Canadian Social Forum. The leadership also gave me considerable latitude to write articles (under the president’s name) criticizing exorbitant CEO pay, master servant relations at work and the social/health impacts of inequality as well as calling for a public telecommunications provider. Yet, even though I’d written a handful of books about Canadian foreign policy, the CEP had little use for my experience in this domain. I only did one minor project related to foreign policy. 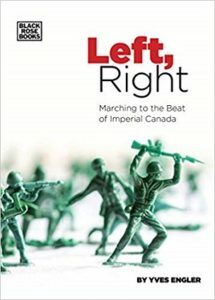 My new book Left, Right: Marching to the Beat of Imperial Canada details unions support for the creation of NATO, Korean War, assassination of Patrice Lumumba, Bay of Pigs invasion, etc. For decades unions openly backed Canadian participation in British and US imperialism. Antiwar and international solidarity activism in the late 1960s and 1970s significantly shifted unions’ alignment. But, the 2004 coup in Haiti offers an example of labour openly supporting imperialism. Québec unions assisted the Canadian/Québecois ruling class’ role in overthrowing President Jean-Bertrand Aristide and thousands of other elected Haitian officials, which spurred widespread human rights violations. The Canadian Labour Congress has extensive historic ties to External Affairs (Global Affairs Canada) and has received much of its international relations budget from the official aid agency. CLC ties to government-backed institutes and NGOs have also shaped unions’ international policies and statements. For instance, the CLC has long been represented on the board of the Canadian Council for International Co-operation (CCIC), an umbrella group representing dozens of major government funded development NGOs (a representative of the United Steelworkers is currently on its board). To get a sense of their politics, the CCIC often invites Canada’s aid minister to speak at its annual conference and the promotion for its upcoming congress is an embarrassing sop to its government financiers. It notes: “Inspired by Justin Trudeau’s 2015 proclamation ‘Canada is Back’, we are presenting panels that illustrate or challenge Canada’s role in global leadership. Are we doing all that we could be doing in the world?” Formulating the discussions this way ignores Trudeau’s arms sales to Saudi Arabia, backing for brutal mining companies, NATO deployments, antagonism towards Palestinian rights, efforts to topple the Venezuelan government, refusal to support nuclear weapons controls, etc. In A Propaganda System: How Canada’s Government, Corporations, Media and Academia Sell War and Exploitation I outlined the main obstacles Canadians face in understanding their country’s role in world affairs. Every year the Department of National Defence, Veterans Affairs and Global Affairs Canada spend hundreds of millions of dollars articulating a one-sided version of Canadian foreign policy. In addition to massive PR departments, DND and GAC also operate history departments, university initiatives and their own media. Alongside government communications initiatives, international and military focused corporations finance university programs, think tanks and PR efforts. Additionally, the corporate media (and CBC/Radio Canada) only permit a narrow spectrum of opinion regarding Canadian foreign policy. The structure of influencing what we perceive about the world outlined in A Propaganda System is 90 percent of the answer to why Canadians think their country is a force for good in the world. But, the broad left has also played a part in justifying Canada’s role within an unfair and unsustainable world economic system. This article was posted on Friday, September 7th, 2018 at 9:35pm and is filed under Canada, Unions.